NOTE: This book has not yet been released. I was given a free Advance Reading Copy by HarperCollins and Edelweiss in exchange for an honest review. This book will be released on June 26, 2018. If you would like to send me an ARC, please see this page. 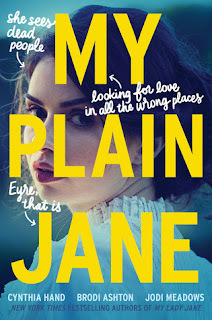 FIRST THOUGHTS: You may remember that last year, I posted a glowing review of My Lady Jane, a historical fantasy comedy written by the same team of authors. This isn't a sequel, per se, but it's a companion, and has the same general setup. Since I was just a big fan of the previous installment, I was thrilled to get an advance copy of this one. And yet... My Plain Jane just didn't do it for me. It's not that I think it's a bad book, and I can think of people that would like it, but compared to its predecessor, it didn't fulfill its full potential. At least, not in my opinion. THOUGHTS ON PLOT: Okay, I feel like I should preface this whole review with a disclaimer. I have not read Jane Eyre! (Yes, I managed to get through multiple high-level English classes without being forced to read it. I do intend to read it eventually, I just... haven't gotten there yet.) However, the book was written in a way that even someone who didn't even know what Jane Eyre is could understand what was going on. And, credit where credit is due, I thought the authors did that very well. I think there were a couple references and jokes that went over my head, but the actual plot, nothing was lost. Unfortunately, the plot didn't feel very substantial. My main problem with it was that the Evil Plot that the villains were carrying out wasn't revealed until the last minute. While the "hidden agenda villain" thing can work, here it felt rushed and tacked-on, almost like an afterthought. There were also a lot of plot developments that felt really contrived. Sometimes that was supposed to be part of the joke, but, well... a lame plot point is still a lame plot point, and the jokes weren't funny enough to just shrug it off and move on. (For an example of funny plot contrivances done right, see the "forest of coincidence" scene in Galavant.) There were also a fair number of plot twists, but they all lacked the proper buildup, and just left me going, "...Really?" I think the authors were trying to make it so it wasn't a straight-up rehash of the original novel, but the end result was rather lacking and difficult to get into. THOUGHTS ON CHARACTERS: Nothing special, which is a real shame. I will admit that this is one place where never having read the original probably detracted from my experience a bit. Part of the fun of retellings is seeing how familiar characters are reimagined and changed. The characters as they were, however, weren't anything spectacular. (Nothing spectacularly bad, either, so that's good, at least.) I liked the way Charlotte was written, but I didn't care much for Jane. I think part of the problem was that Charlotte has such a strong and dynamic personality, so Jane, who's a bit of a shrinking violet, gets lost in the process. Not that there's anything wrong with having a shy and demure main character, but it can be hard to write well, especially when you put them next to someone more outgoing and forceful. The side characters were all pretty one-note, so not much to say there. THOUGHTS ON WRITING STYLE: Okay, this was the real letdown. By far the best thing about My Lady Jane was the humor, especially in the narration. While this book had some of that, it just wasn't as funny. There were some witty asides here and there that made me chuckle, but it wasn't anything LOL-worthy. It also lacked the same "can't put it down"-ness of the first book. I basically skimmed the last half, just to finish it. I wanted to know how it ended, which is something, but overall, I just wasn't invested. THOUGHTS ON POLITICAL STUFF: This is a rewrite of a novel from the 1800s; unsurprisingly, there are no POC or queer people to be seen. I personally don't think being set in a historical period is a good excuse for not having any diversity, but I'm also not very surprised. There's nothing glaringly offensive, though. FINAL THOUGHTS: I can't help but wonder if I'd have liked this book more or less if I'd read Jane Eyre first. Jane Eyre is on my reading bucket list (which you can look at here, if you're curious), so I do plan to read it eventually. As a followup to My Lady Jane, however, this was a major disappointment. I won't let it turn me off from checking out any other books in the series, since they all stand alone, anyway, but as one of my most anticipated books of 2018, this was a huge letdown. Here's hoping the third installment picks up the pace again. 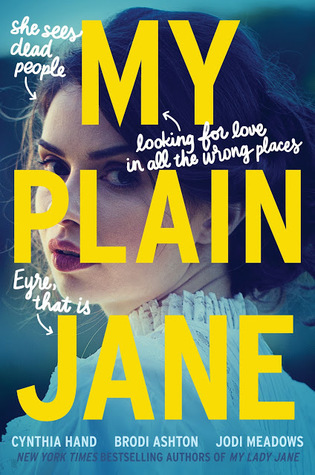 If you've read or are planning to read My Plain Jane, I'd love to hear your thoughts in the comments below!